Each year at this time we bring you a story about the arrival of the Atlantic Bonito and how you can better enjoy fishing for these visitors to the Carolina Coast. Every year we reach out to who we believe is the most knowledgeable source of information on the topic. Captain Lee Parson has been fishing the North Carolina waters for over 50 years. 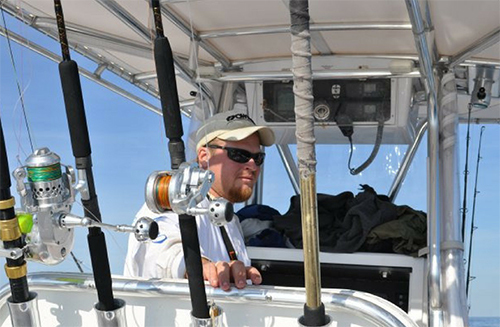 His passion for the outdoors and especially saltwater fishing is unmatched. 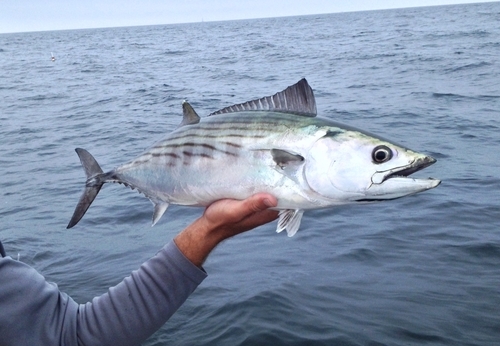 Again this year, Captain Lee shares is experience on fishing for Atlantic Bonito. We hope you benefit and enjoy his thoughts and knowledge. This article is based on not only his words, but also the many days I had the privilege watching him pursue his art. He is a true “Legend of Saltwater Fishing”. The arrival of the Atlantic Bonito signals the beginning of the spring and summer fishing season in the coastal Carolinas. While only here for a short period of time, these silver speedsters are both invigorating to catch and great to eat. Best of all, they always provide a unique fishing experience that will challenge anglers of all skill levels. From maneuvering your boat around the ever-moving schools to making the right cast and having the proper drag setting once you’re hooked up, fishing for bonito on the Carolina coast will provide many great experiences. Captain Lee Parsons of Topsail Island, NC has been fishing for these short-term visitors of the Carolina coast since the mid-’80s when he would fly fish for them. Since that time, he has moved on to become one of the best-known light tackle experts on the North Carolina coast for Bonito. He’s been known to return to the dock after a day of Bonita fishing, clean a few fish, then open his dock box to retrieve a bottle of wasabi sauce and invite his charter patrons to join him in sampling the day’s catch. This is a tradition that I’ve witnessed many times first hand. In my early years as guide, I fished alongside Captain Lee frequently in the late ’90s targeting Bonito. I knew that as a new guide, I couldn’t go wrong if I fished within sight of Lee and mimicked everything he did. I even kept a small notebook in my tackle bag to keep notes on the type and color of the lures he used and other tactics that he used to earn such a great reputation. Later I learned that Lee would have gladly given me any advice I needed if had been brave enough at the time to ask. Even today, Lee is still my go-to guide for any questions I have about Bonito. One of the first things I learned from Lee was that the Atlantic Bonito are only on the Carolina coast for a few weeks each Spring. They usually come in around April 15th, the last day to file taxes. Pay your taxes, then go Bonito fishing, or the other way around is how I always remembered. The fish migration varies greatly by the water temps and movement of the bait. The water temperature needs to be at a minimum of 58 degrees and a maximum of 64 degrees, for them to stay in the area. Once the temperature moves past 64, they head north and spend the summer around Nantucket. When Bonito get near the latitude of the Carolina coast, they can be anywhere from the Gulfstream to just a mile or 2 off the beaches. They can likely be found over structure as well as live and hard bottoms since that’s where bait often congregates. Rigging for them is simple. 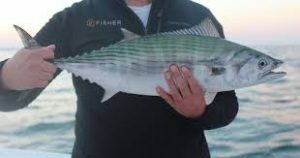 You can use a wide range of lures thanks to the aggressive nature of the fish. Captain Lee likes to use a ½ ounce white jig head with a pick trout killer. He also likes to use the clear blue Zara Spook as another alternative. Both these lures allow you to cast them beyond the school, letting it drop a bit and then retrieving. Another key step is making sure your reel’s drag is set properly, due to the sudden strike of the fish, improper drag can cause line breaks. The goal is to allow the Bonito to run a bit and gradually adjust the drag. Once the fish slows down, turn it around and bring it to the boat. Bonita fishing is a great way to start the fishing season. If you’ve never done it, put it on your “bucket list”. It provides wonderful memories and tasty results.